During the transition of the 18th to the 19th century earth sciences experienced a major revolution - the principles of the modern identification of rocks was introduced and sediments subdivided by the content of embedded fossils. Animals of the past apparently differed from modern ones in their abundance and in their diversity (so they could be used to subdivide the stratigraphic column) and some organisms were completely unknown to modern scholars. These observations led to a major problem: if these organisms are today unknown, are they surviving in remote regions of the globe and yet not discovered? Classic monsters, like sea serpents along the shores of North America, the giant kraken along the shores of Africa and even sirens in the sea surrounding the United Kingdom, were spotted and depicted in books for centuries (and still today), but now naturalists responded with scepticism and reluctance to these stories - reports coming from America were soon considered as "Yankee Humbug" by European scholars. "…we hope that nobody thinks to search them for real, it would be like searching the animals of Daniel or the beasts of the apocalypse. Let us not even search for the mythical animals of the Persians, results of an even greater imagination." In 1796 the third president of the United States, also president of the American Philosophical Society and naturalist Thomas Jefferson (1743-1826) studied some fossil bones and a giant claw discovered during mining activities in a cave. 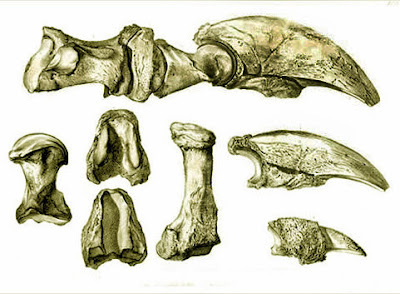 March 10, 1797 he presented the results to the Philosophical Society under the title "A Memoir on the Discovery of Certain Bones of a Quadruped of the Clawed Kind in the Western Parts of Virginia" and concluded that these remains belong to a giant felid " three times as large as the lion" which he named "Megalonyx" (great claw). Fig.1. Engraving of the bones of the foot, toe, and claw of Megalonyx, as published in a paper by Caspar Wistar "A description of the Bones deposited by the President, in the Museum of the Society, and represented in the annexed plates." 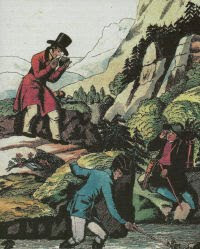 (1799). Jefferson's Megalonyx paper, which had no illustrations of the bones, was published in the same volume of American Philosophical Society Transactions. "In the present interior of our continent there is surely space and range enough for elephants and lions, if in that climate they could subsist; and for the mammoth and megalonyxes who may subsist there. Our entire ignorance of the immense country to the West and North-West, and of its contents, does not authorise us so say what is does not contain." Jefferson based this conclusion in part on anecdotes of woodsmen being terrorized by a large cat-like animal in the wilderness and the presumed representations of lions in Indian rock paintings (possibly the American lion Panthera atrox ?). However the most important argument for Jefferson was a theological one: if a species can become extinct in a perfect divine creation such a creation can't possibly be so perfect all along, the continuous loss of species would inevitable lead to the end of this imperfect creation. "The movements of nature are in a never ending circle. The animal species which has once been put into a train of motion, is still probably moving in that train. For if one link in nature's chain might be lost, another and another might be lost, till this whole system of things should be evanish by piece-meal; a conclusion not warranted by the local disappearance of one or two species of animals, and opposed by the thousands and thousands of instances of the renovating power constantly exercised by nature for the reproduction of all her subjects, animal, vegetable, and mineral." Fig.2. Sketch of the so called "Madrid skeleton" sent to Jefferson by tradesman William Carmichael in 1789. 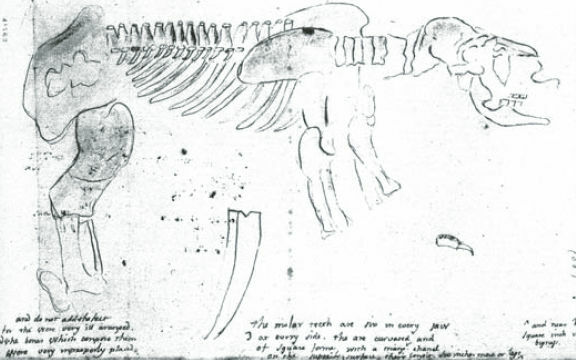 A large skeleton was found near Buenos Aires, in his letter Carmichael notes "I also inclose…a discription of the Skeleton of an Animal discovered lately in Spanish America. I supposed these to be objects of Curiosity to you,…" Jefferson recognized that the bones and claw he had attributed to his large cat Megalonyx were comparable to these of this animal, described in 1796 by Cuvier as Megatherium. Jefferson also collected all sorts of information about large mammals and bones to support his view of the new continent as populated with fascinating animals as the old continent and rest of the world. Jefferson also had some political motives to support the existence of large and ferocious animals in the U.S. In his works the eminent France naturalist Georges-Louis Leclerc, Comte de Buffon (1707-1788) proposed a theory to explain the worldwide distribution of animal species: from environmental optimal centres species would spread all over the globe, however degenerating in areas with less favourable climate or environment - and according to Buffon the fauna of America was an perfect example of such a degenerated European and African fauna. "The bones of the Mammoth which have been found in America, are as large as those found in the old world. It may be asked, why I insert the Mammoth, as if it still existed? I ask in return, why I should omit it, as if it did not exist? Such is the economy of nature, that no instance can be produced of her having permitted any one race of her animals to become extinct; of her having formed any link in her great work so weak as to be broken. To add to this, the traditionary testimony of the Indians, that this animal still exists in the northern and western parts of America, would be adding the light of a taper to that of the meridian sun. Those parts still remain in their aboriginal state, unexplored and undisturbed by us, or by others for us. He may as well exist there now, as he did formerly where we find his bones." In 1803 Jefferson organized the famous Lewis and Clark expedition; apart political important tasks, like the geographical exploration of Louisiana and the search for a navigable passage to the Pacific, this expedition should also dig for fossils and search for the supposed unknown large tetrapods of North America. Jefferson in his lifetime never really embraced the theory of extinction, probably as a results of personal religious beliefs and political agenda - only in the mid 19th century extinction will become a scientific fact.